Extra! A family connection to actor Barton MacLane (in honor of “Svengoolie” and his big Me-TV broadcast premiere of 1944’s “Cry of the Werewolf” on Me-TV)! Barton MacLane in “Cry of the Werewolf” (1944), taken during Svengoolie‘s “fun facts” Segment during his Oct. 13 big broadcast premiere of the aforementioned film on Me-TV! “Svengoolie” (portrayed by Rich Koz): Weigel Broadcasting Co./WCIU-TV, L.P./Me-TV Network/U-City Productions “Cry of the Werewolf:” Columbia Pictures Industries, Inc. 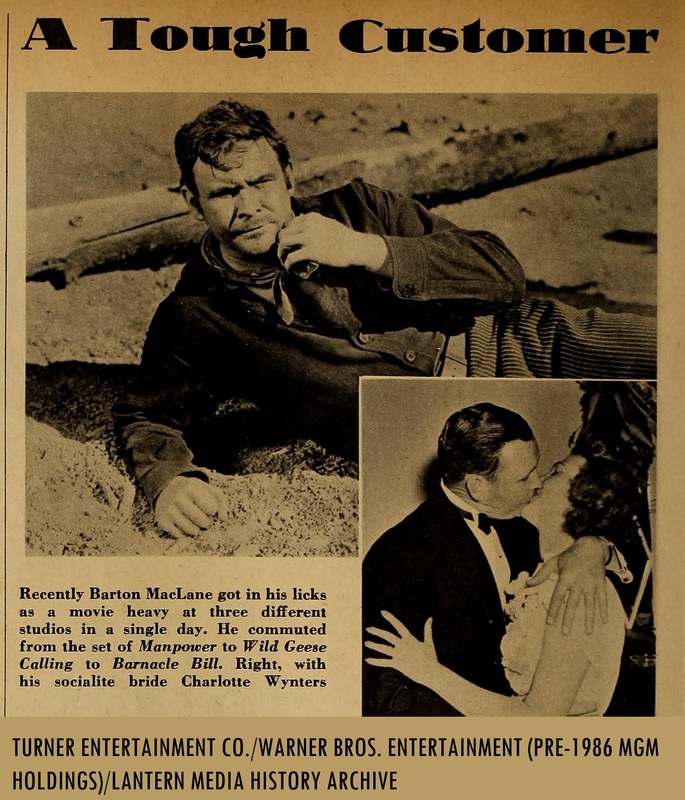 Fellow Svengoolie SvenPals will be delighted to know about a family connection to actor Barton MacLane (for 1944’s “Cry of the Werewolf”). Original 1944 Columbia Pictures lobby card/publicity photo for “Cry of the Werewolf,” with Barton MacLane, Nina Foch and Stephen Crane. Born under the name of Ernest Barton MacLane on Christmas Day (Dec. 25) 1902 in Columbia, South Carolina; MacLane moved with his family to the small town of Cromwell, Connecticut at the age of seven (according to Robert and Kathleen Hubbard’s Arcadia historic publication, “Legendary Locals of Middletown”). Upon entering Connecticut, MacLane attended St. John’s Parochial School in Middletown, Connecticut (according to my late aunt’s recollections, the information on the family connection to MacLane follows after his film and TV credits). He graduated from Middletown High School in 1921 and attended Wesleyan University, where he majored in athletics (notably in football, baseball and basketball). One of MacLane’s major achievements during his time at Wesleyan was that he made a 100-yard kickoff return during one of his Wesleyan football games in 1924. Because of his achievement, Paramount Pictures talent scouts encouraged MacLane to go into the field of acting in motion pictures. His first film appearance was in an uncredited role in “The Quarterback” (1926, with Richard Dix). Barton MacLane (as John Kelly) in a publicity photo for MGM’s “Barnacle Bill” (1941). Also included is a wedding picture of MacLane with his second wife, Charlotte Wynters (Wynters and MacLane were married until Barton MacLane’s death in 1969). MacLane made many notable appearances in popular motion pictures throughout his acting career as a character actor along with his 1944 Columbia appearance in Henry Levin’s “Cry of the Werewolf” (1944, w/ Nina Foch and Stephen Crane), including an earlier uncredited role as a bather in the Marx Bros.’ first feature; “The Cocoanuts” (1929). His other noteworthy film and TV appearances were in “‘G’ Men” (1935, w/ James Cagney), “The Walking Dead” (1936, with Boris Karloff), Warner Bros.’ “Torchy Blane” journalist-detective film series with Glenda Farrell (MacLane played the role of Steve McBride in the series from 1937–39), John Huston’s adaptation of “The Maltese Falcon” (1941, in the role of Lt. Det .Dundy, w/ Humphrey Bogart, Mary Astor, Sydney Greenstreet, Peter Lorre and Ward Bond), “Dr. Jekyll and Mr. Hyde” (1941, in the role of Sam Higgins, with Spencer Tracy, Ingrid Bergman and Lana Turner), “The Treasure of the Sierra Madre” (1948, in the role of McCormick, w/ Bogart, Walter Huston and Tim Holt), “The Glenn Miller Story” (1954, as Gen. Arnold, w/ James Stewart, June Allyson and Harry Morgan) and Frank Capra’s “Pocketful of Miracles” (1961, as a police commissioner, w/ Bette Davis, Glenn Ford and Peter Falk). One of MacLane’s most famous roles (which would also be his final role) during the latter part of his career was his role of Gen. Peterson in Sidney Sheldon’s sitcom, “I Dream of Jeannie;” w/ Barbara Eden, Larry Hagman, Bill Daily and Hayden Roarke. MacLane appeared in Sheldon’s sitcom from 1965 until MacLane’s death on New Year’s Day (Jan. 1), 1969. Family connection: Barton MacLane attended the same school that my great-grandfather attended! St. John’s Parochial School (school diploma moniker from my great-grandfather’s diploma). My great-grandfather attended the same school as Barton MacLane! My late aunt on my mother’s side (my aunt died in 2005) stated that my great-grandfather (d. 1965) attended the same school that actor Barton MacLane attended (when MacLane and his family moved to Connecticut), St. John’s Parochial School in Middletown, Connecticut (which was connected to St. John’s Church), not too far from the towns of Cromwell and Portland, Connecticut)! I recall that my aunt stated that MacLane and my great-grandfather were several grades apart when they attended St. John’s Parochial School! Years ago, my aunt mentioned that MacLane was usually typecast as villains (mostly in B-westerns), police detectives and military generals due to his status as a character actor. My first glimpses of seeing Barton MacLane on the TV screen growing up was during syndicated re-runs of “I Dream of Jeannie.” Up to today, whenever we catch re-runs of “I Dream of Jeannie” on TV and if it’s an episode with Barton MacLane (as Gen. Peterson), my mother will state “there’s the man that attended the same school as your great-grandfather)! I then discovered most his classic Warner Bros. character actor roles on public TV (mostly through WETA-TV 26) and through Turner Classic Movies (where I first caught MacLane’s appearances in Warners’ “Torchy Blane” film series). While attending High School, my late High School English/literature instructor (d. 2018) purchased a copy of the 1941 MGM version of “Dr. Jekyll and Mr. Hyde” on DVD for the class to watch (paired with the 1931 version with Fredric March). When we watched the 1941 version with Spencer Tracy, I instantly recognized Barton MacLane’s appearance as Sam Higgins in the film! When I told my friends and my instructor about MacLane attending the same school that my great grandfather attended, they were all delighted and overjoyed! 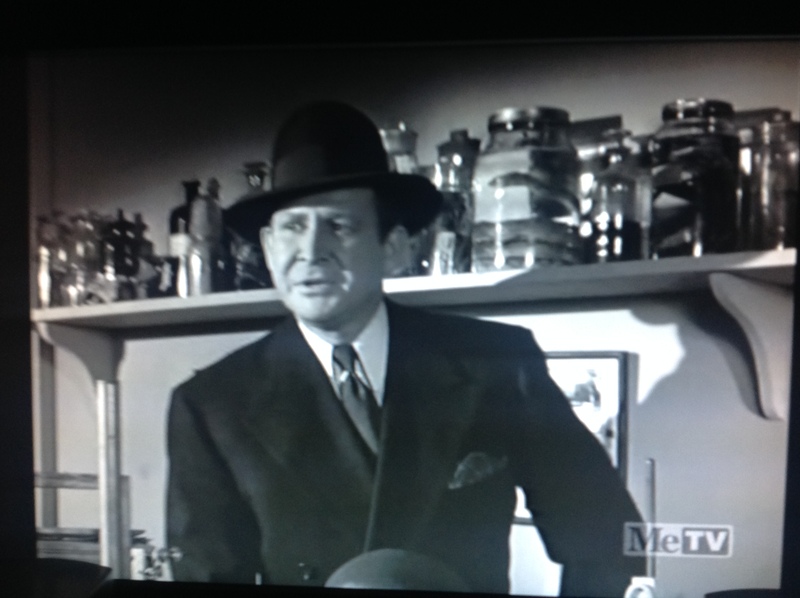 I thought that it would be interesting to share with all of my SvenPals my family connection to actor Barton MacLane during Svengoolie’s big broadcast premiere of “Cry of the Werewolf” (1944) this evening on the airlanes of Me-TV! Hope you all enjoyed reading this extra tidbit on “Silver Screen Reflections!” -C.H. 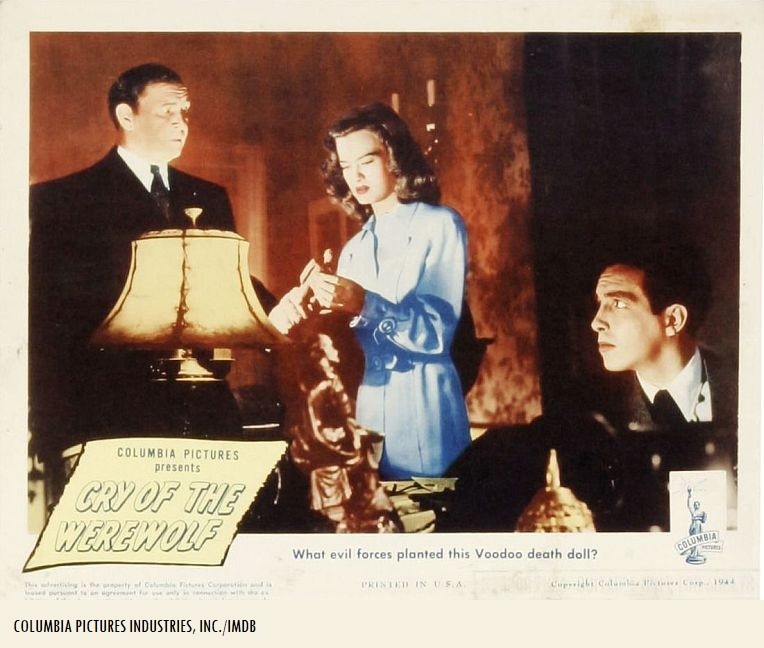 Questions/comments about “Svengoolie,” Barton MacLane and/or “Cry of the Werewolf” (1944)? Drop a line in the comments section!